Ever since he assumed office in 2017, the big question has been whether President Emmerson Mnangagwa could stop Zimbabwe's economic slide before social unrest erupted in response to biting hardships, driving away the very investment that could prevent further economic decline. Mid-January's violent demonstrations and stay-away suggest that he has lost the race. A second question has also been answered - whether, if protests did erupt, the government would walk the talk of a 'new dispensation' that had broken with the repressive policies of Robert Mugabe. The initial signs were ambiguous. The administration's first test, before it even secured a mandate following the July 2018 general elections, was in how it dealt with protests over the delay in announcing election results and suspicions of election rigging. The 1 August demonstrations were brutally crushed through the swift deployment of the military. Soldiers gunned down fleeing civilians, killing six and wounding scores more. Mnangagwa remained aloof, allowing perceptions that the tragic debacle was the fault of his loose-cannon vice president, former defence forces commander Constantino Chiwenga. A commission of inquiry led by former South African president Kgalema Motlanthe was hastily assembled to investigate, indicating a concern with optics wholly alien to Mugabe. Mnangagwa is no born-again democrat. His last few actions in the dying months of the Mugabe era were to drive through amendments to the country's 2013 constitution and laws which severely compromised the independence of the judiciary and prosecutor-general. Mugabe's hatchet man for 37 years after independence, he gained a reputation for ruthlessness and callousness. The anxiety to present Zimbabwe under his leadership as a 'Second Republic' where the economy and democratic space would be opened up is certainly not part of any deeply held conviction. It is motivated by the recognition that to attract investment and a cash infusion from western countries, some regard would have to be paid to human rights. The spark for the mid-January protests was a 150% hike in the fuel price, announced as Mnangagwa was about to embark on a five-nation tour. The itinerary, encompassing Russia, Belarus, Azerbaijan and Kazakhstan (the last stop was Davos, which has now been abandoned), was clearly not one designed to enable information exchange on good governance. Attempts to lure investment from the West have had limited success. Mnangagwa appears to be focusing on governments more concerned with political stability and the safety of investments from marauding rioters than human rights - such as those on his itinerary, and China. The change was reflected in the response to the protests. The intention now seems to be to present the government as one that will firmly suppress, rather than tolerate, dissent. The Motlanthe Commission's recommendations concerning the deployment of the military and use of live ammunition have been ignored. In the aftermath of the protests, civil society organisations report 12 people shot dead and 78 being treated for gunshot wounds. Many more have been hauled from their homes by soldiers and brutally beaten and tortured, often simply because they fitted the profile of the protesters. Half the country's US$10 billion domestic debt has been run up under Mnangagwa's administration. Over 700 people have been incarcerated in dragnet arrests, and opposition leaders and activists jailed without bail on charges of 'subversion' simply for making statements supporting the stay-away. Government claimed that the stay-away and protests were orchestrated through social media, and ordered a blanket shutdown of the internet. Less clear is the answer to a third question - whether the heavy-handed response to the protests was a result of policy discord and acrimony between the Mnangagwa and Chiwenga. On his return to Zimbabwe, Mnangagwa seemed conciliatory, saying 'misconduct' by the military was 'a betrayal of the new Zimbabwe' and would be investigated. However Mnangagwa must be aware that he has now played good cop to Chiwenga's bad cop once too often and that such statements will probably be treated with considerable scepticism. 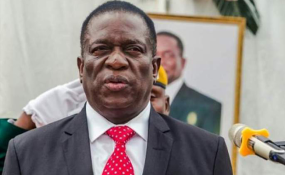 While Mnangagwa was travelling, presidential spokesperson George Charamba remarked that 'the response so far is just a foretaste of things to come'. It is assumed he had approval from the 'fully briefed' president for this hard-line statement. That there is more to come is certain. Zimbabwe's problems are rooted in Mugabe's profligacy and disastrous economic policies. From 2013, the government clocked up massive budget deficits. They were funded by the prolific issuance of treasury bills. Unable to pay these bills on maturity, the government resorted to the simple (albeit unlawful) expedient of ordering the Reserve Bank to make book entries into the credit columns of banks holding the maturing bills. In this way, billions of dollars of 'electronic money' were created from thin air. With Mnangagwa coming into office in an election year, he was not about to engage in austerity measures. Half the country's US$10 billion domestic debt has been run up under his administration. Although officially denominated as US dollars, electronic money has inevitably declined in value against real money. Before the recent protests, it traded at about 3.4 electronic dollars to one real US dollar cash. Imports, of course, must be paid in real dollars. That means a 3.4-fold increase in the price of imported products paid for by consumers in electronic money, and a sharp erosion of the purchasing power of worker salaries received in electronic money. Zimbabweans in formal employment and paid electronic money have found it impossible to make ends meet. The year began with strikes by civil servants for salary increments. These salary increases can only be paid through the issuance of more treasury bills, and a resultant further decline in the purchasing power of the improved salaries, returning workers to square one or worse. There doesn't appear to be any short-term solution. Government feels it can do no more than to sit heavily on the boiling pot. Expect to see it boiling over in the months to come.